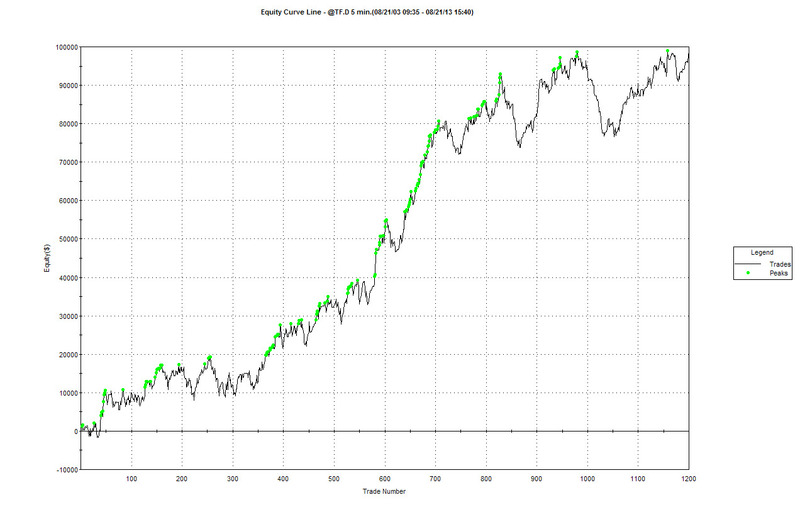 George Pruitt - Page 9 of 9 - Backtesting with [Trade Station,Python,AmiBroker, Excel]. Intended for informational and educational purposes only! Final version posted below. A little advanced but if you can follow and make sense of it then you are well along on becoming an EasyLanguage programmer. Just got word the 2nd edition is being published in Chinese. THERE IS A SUBSTANTIAL RISK OF LOSS IN TRADING. IT IS IN THE NATURE OF COMMODITY TRADING THAT WHERE THERE IS THE OPPORTUNITY FOR PROFIT, THERE IS ALSO THE RISK OF LOSS. COMMODITY TRADING INVOLVES A CERTAIN DEGREE OF RISK, AND MAY NOT BE SUITABLE FOR ALL INVESTORS. PAST PERFORMANCE IS NOT NECESSARILY INDICATIVE OF FUTURE RESULTS. THE HIGH DEGREE OF LEVERAGE THAT IS FOUND IN FUTURES (BECAUSE OF SMALL MARGIN REQUIREMENTS) CAN WORK AGAINST YOU AS WELL AS FOR YOU. I.E. YOU CAN HAVE LARGE LOSSES AS WELL AS LARGE GAINS. Instead of having multiple buy orders at different levels -simply change your buy levels using the for-next loop and issue just one order. Only problem is you can only issue one buy order per bar. Whereas the former approach will place multiple orders for the next bar. Usually this will not cause a problem unless your buy/sell levels are very close. The use of the for-next loop is up to one's own programming style. I like the for-next loop. MultiCharts is a very powerful program that can be purchased outright and seems to be very compatible with EasyLanguage. Their software requires a third-party data feed or ASCII data. This just happened recently in the bond market. The LastTradeLoser filter prevented the Turtle 20 bar low entry from occurring. As you can see from the prior trade – it was a winner. The following code uses our new functions to synthetically keep track of our trading to determine when to enter a new trade. The Turtle System only took trades after a losing trade took place. Even with the Virtual Trade functions you still need to keep track of whether the entries/exits generated a profitable trade. It simple enough to track the real trades – compare the entries/exits when a the market position changes. [stop,limit,market] and we will reply with with true or false and the fill price. Here is a nice little function that helps determine market choppiness. This function measures the actual distance the market moves against the total distance traveled. If the market starts in the lower left of your chart and moves, without much gyrations, to the upper right then the CMI will reflect a higher value. However if the market moves frantically around the chart and doesn’t achieve a great distance from the initial to the end points then the CMI will reflect a lower number. You can use the CMI function to help determine when you should follow a Turtle style break out. If the market has been trading in a range and you get a break out it might just carry a little more validity. Buying/Selling at really high/low prices may lead to false break outs.